An ancient and malicious curse has fallen on Arkham. It is whispered that some of the strange artifacts on display as part of the "Legacy of the Pharaohs" exhibit have vanished. Those who seek these treasures find nothing but unspeakable horrors. Meanwhile, a dark and mysterious figure, garbed in ancient Egyptian raiments, has been seen roaming the streets. This man, it is said, is a living curse to all he encounters. Fear grips the city, and it falls to a small group of investigators to stop the supernatural evil that creeps through the streets of Arkham! 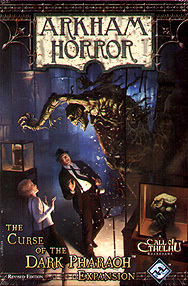 The Curse of the Dark Pharaoh (Revised Edition) is an expansion for the Arkham Horror board game by Fantasy Flight Games. It provides updated versions of the components from the original Curse of the Dark Pharaoh expansion including 90 new Ancient One cards and 76 new Investigator Cards, consisting of new allies, new spells, Benefit and Detriment cards, and Exhibit Items. This revised edition also includes components not previously available with the original expansion, such as the Dark Pharaoh Herald Sheet, the Ancient Whispers marker, Patrol markers, and Exhibit Encounter cards, which describe the strange and deadly situations in which investigators discover the ancient relics scattered across Arkham.